I was having a look through my photos of this trip and decided that I would upload the best photos and then write around them. Here goes. I wrote a separate race report. When I arrived in NYC the queue at immigration was awful (stupid terrorists). I was desperate for the loo and had just realised that I had bought no US dollars. It took an hour and three quarters. It was not enjoyable. I had booked to stay in an AirBnb in a Brooklyn brownstone. 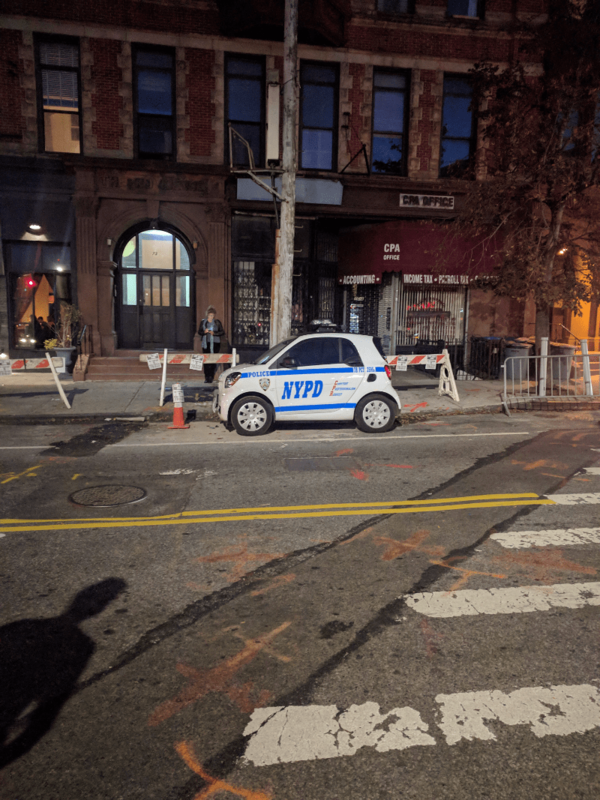 Whilst making my way to my AirBnb I saw this. It amused me. I had to pass by the Barclays center and the main Brooklyn train/MTA station. It was all pretty impressive. it turns out that Brooklyn is not the small tony suburb of NYC that I had always assumed. On the first day I went to the expo to get my race number. 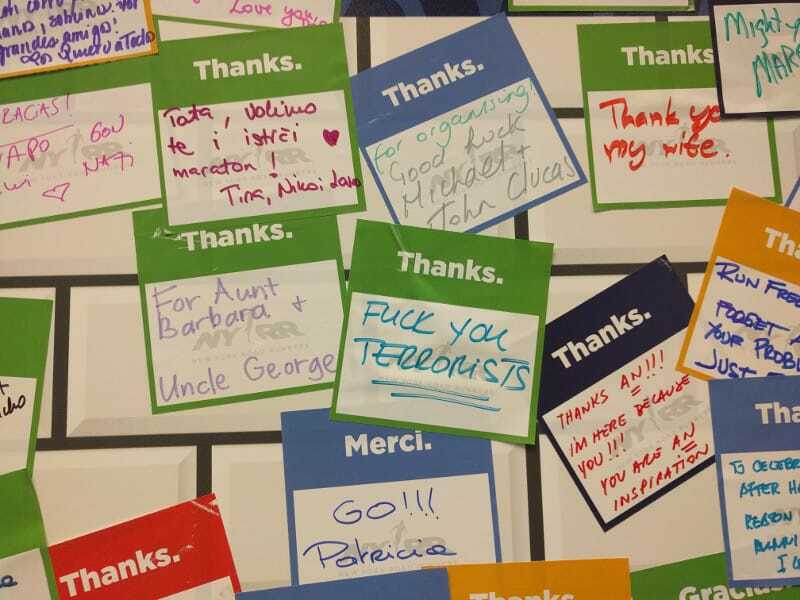 Someone aptly summarised my thoughts on the message wall. I lost in a battle with New Balance. As title sponsors they had a massive area for their merchandise. I saw a cool singlet on a mannequin and when I realised it was the only one left (because other people thought it was equally awesome) I had to get it. $40 singlet. Eurgh. Apparently this is what I should be aiming for. Meh. So it turns out that New York is pretty beautiful. 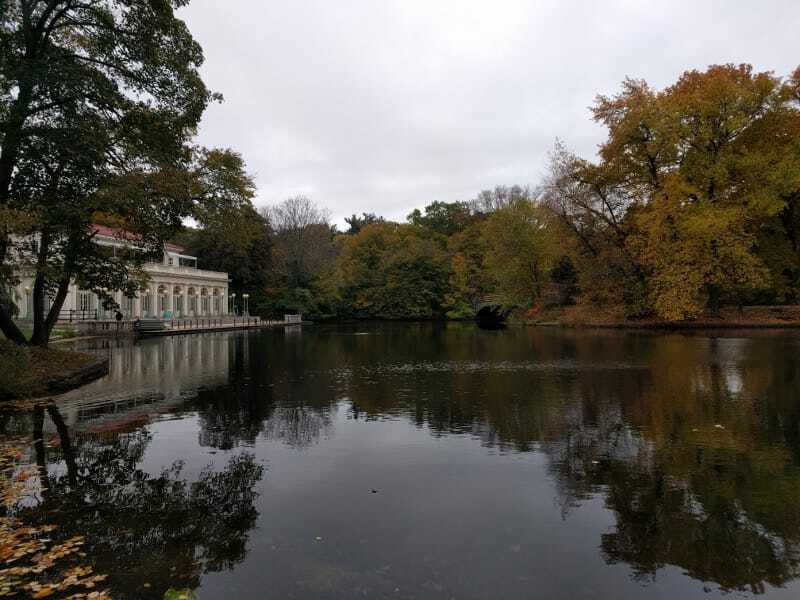 Over the course of my time in NYC I stumbled around loads of the parks intermittently placed throughout the city. They are all awesome, and all different. 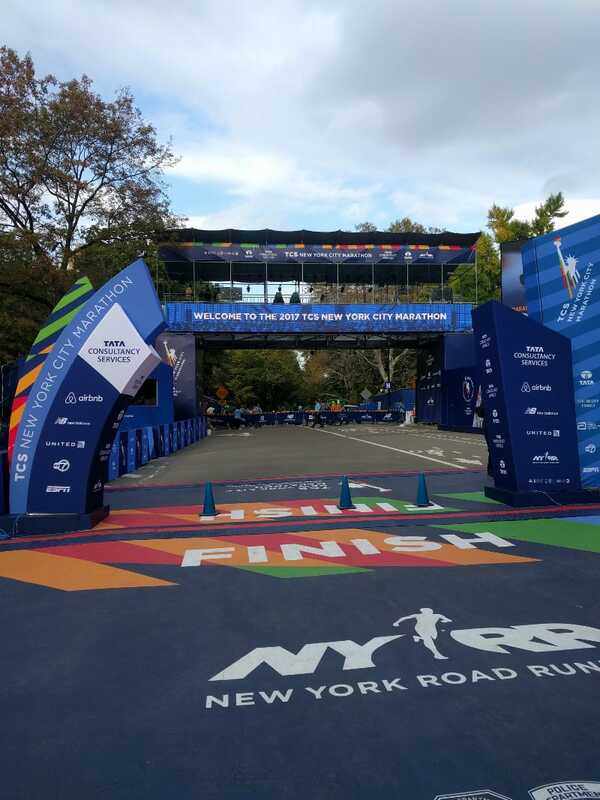 I went to have a look at the finish line. 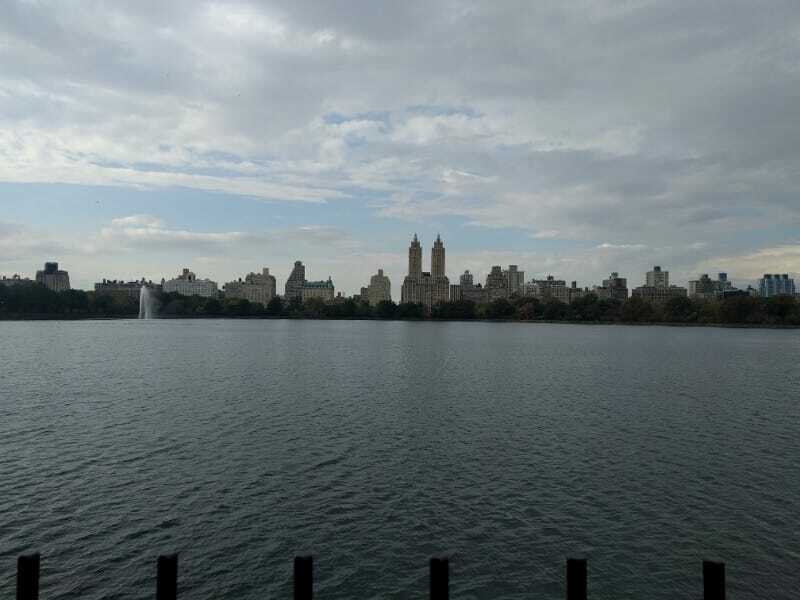 I ended up at the wrong end of Central Park so I walked around the whole park. There are worse places to walk, but probably not the wisest of ideas the two days before a marathon. 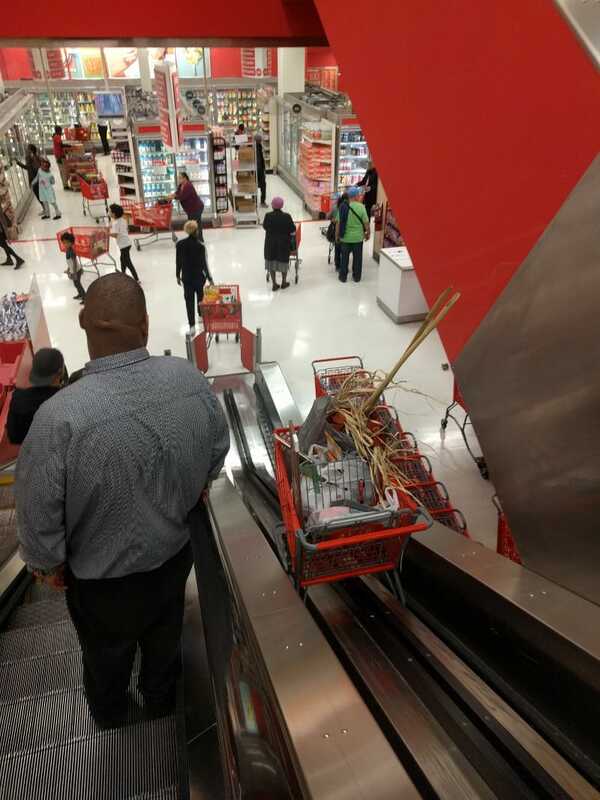 I went to Target. This made me smile. 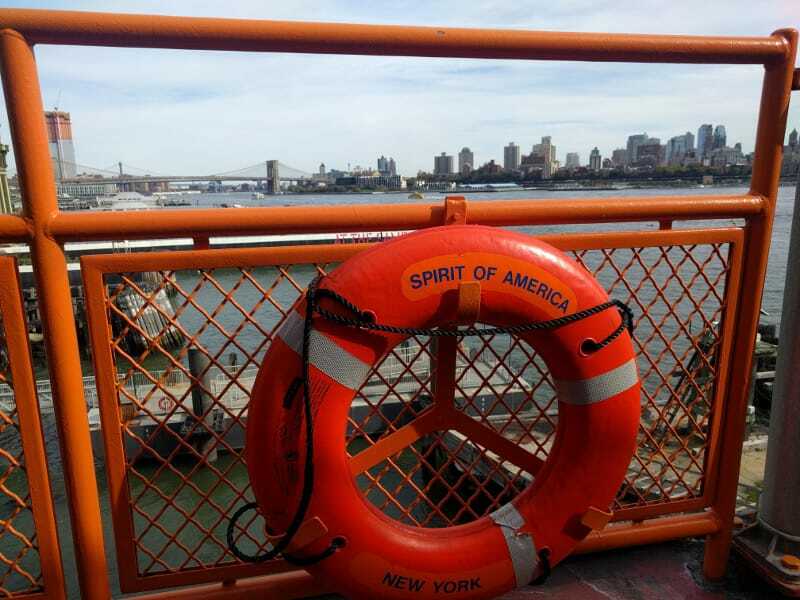 The day before the race I went to investigate the Staten Island ferry. It was relatively simple, and once again pretty awesome to look at. Whilst I went to the start line on Staten Island on race day I never actually took the time to look around. 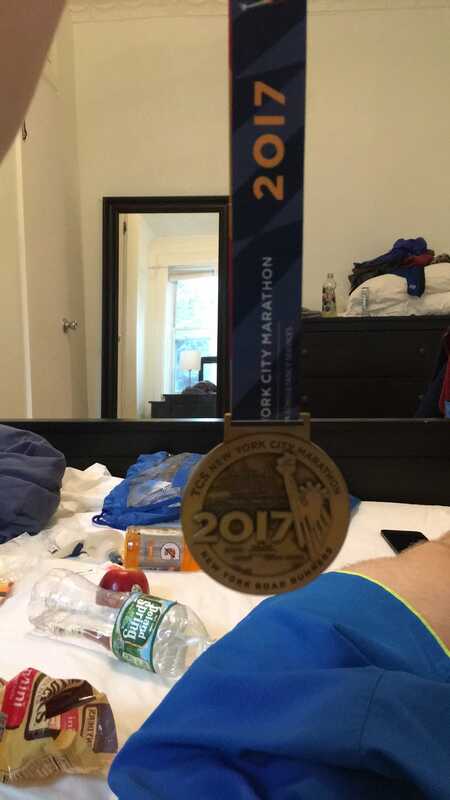 I ran a marathon. I won a medal. I also got an apple and some pretzels. At one point I went to look for 'the best pizza in New York'. When I got there there was a queue. In my experience queues correlate well with 'no longer actually any good' so I did not wait. 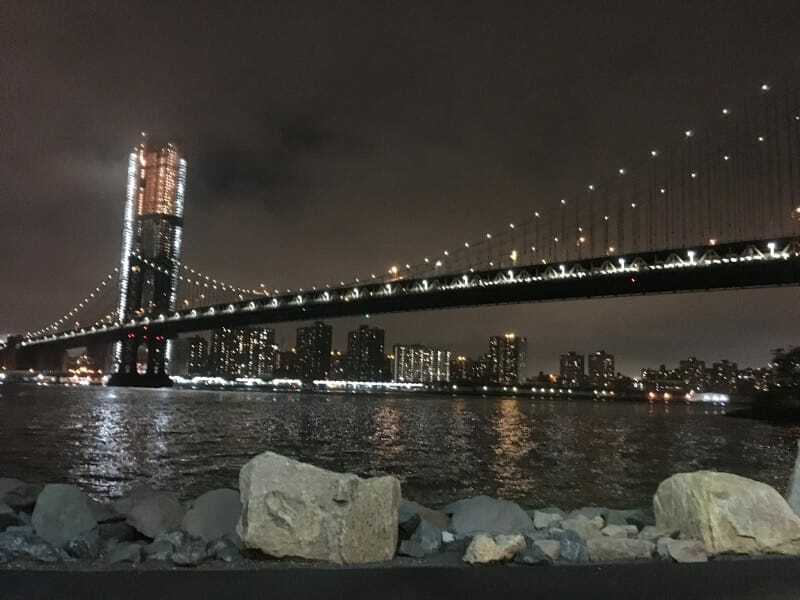 I did hoever get to stumble upon the Brooklyn Bridge at night. One of the women staying in my AirBnb was on the press team. She siggested that the day after I go an watch the various charity presentations. I did. 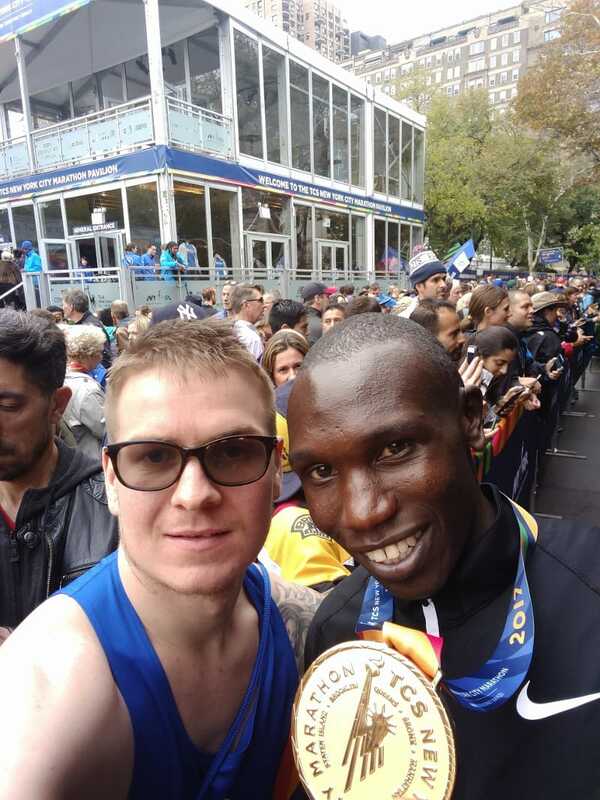 I got a selfie with Geoffery Kamworor. 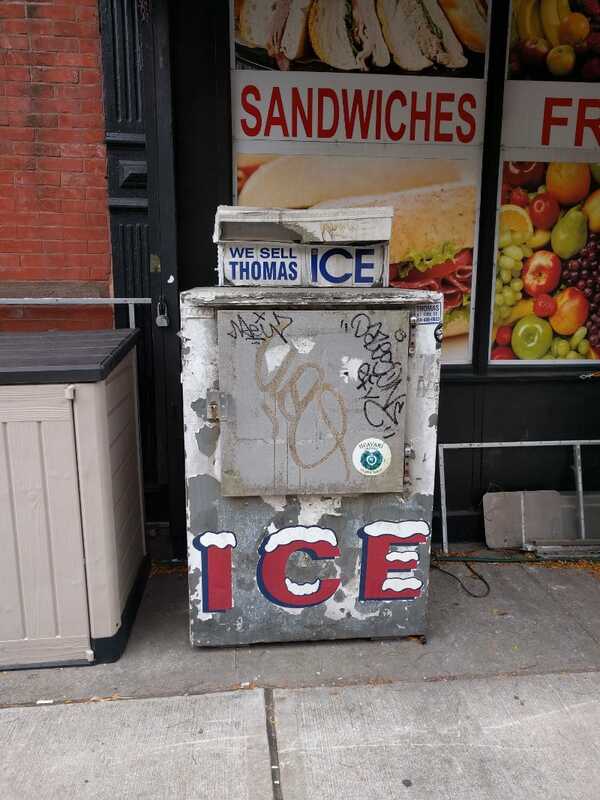 Whilst stumbling around NYC I was informed that I could buy ice. This is Propspect Park. This was 2 minutes away from where I was staying and right in amongst the buildings of Brooklyn. It was fairly hard to take a bad photo. I made my way to Coney Island just to see what was going on. I tried a Nathan's hot dog (mediocre), and walked along the promenade. 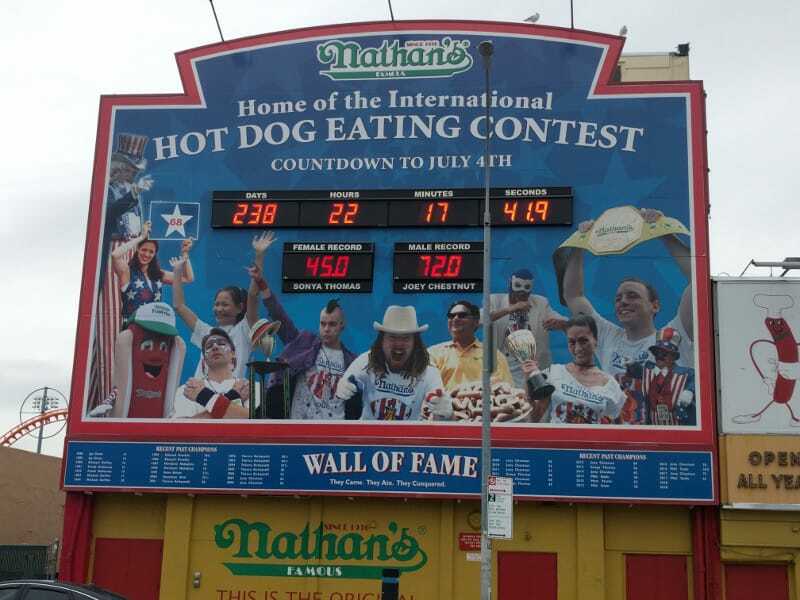 I have no idea who would want to/how it is possible to eat 72 of these hot dogs. Mainly because they don't taste good. 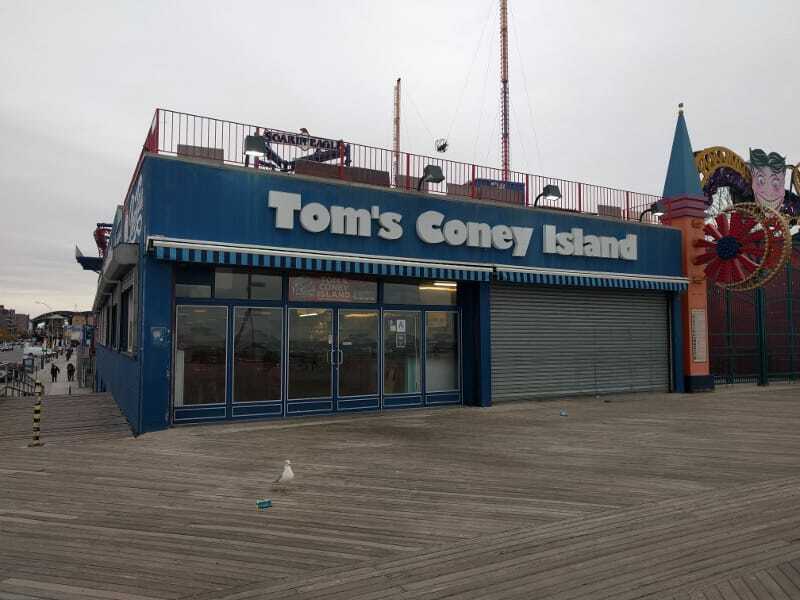 Coney Island was a ghost town because it was freezing. All the amusement rides were closed but not very well secured. I would never ride those rides as it looks as though anyone could just wonder around and unscrew the safety features of the rollercoasters. 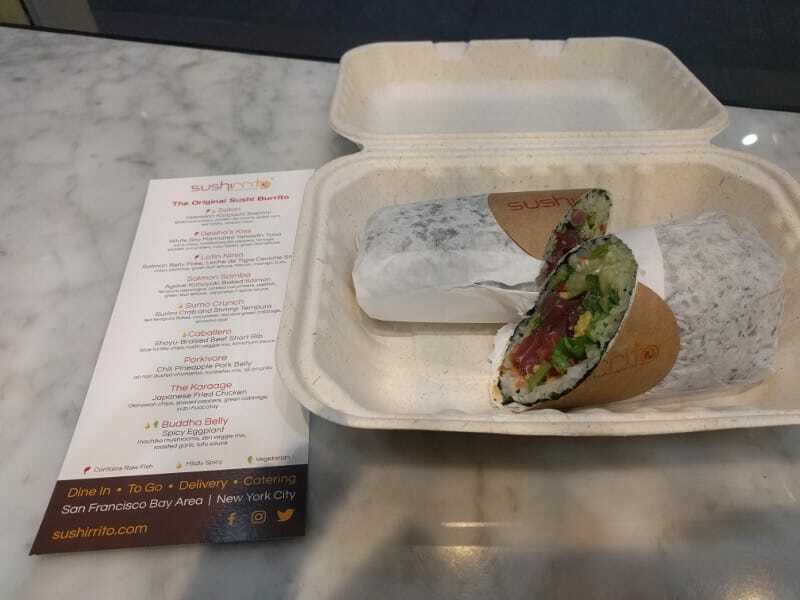 Back in Manhattan I stumbled upon Sushiritto. Its a burrito sized piece of sushi essentially. I got the 'Geisha's Kiss'. It was amazing, but expensive ($14). If you like sushi.. highly reccomended. 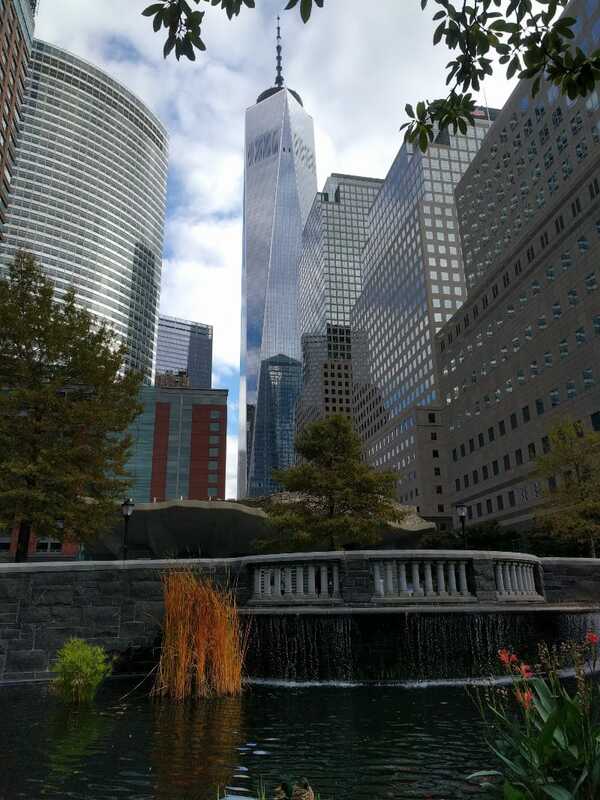 I wondered around another park in Manhattan. This photo demonstrates fairly well how the city and the parks share the same space. It is pretty cool. 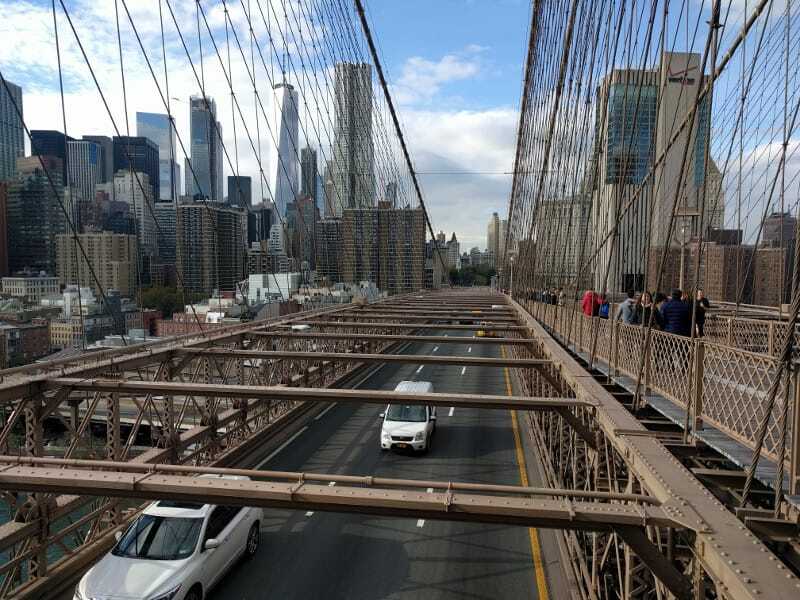 And finally, here is a view of Manhattan looking back across the Brooklyn Bridge. 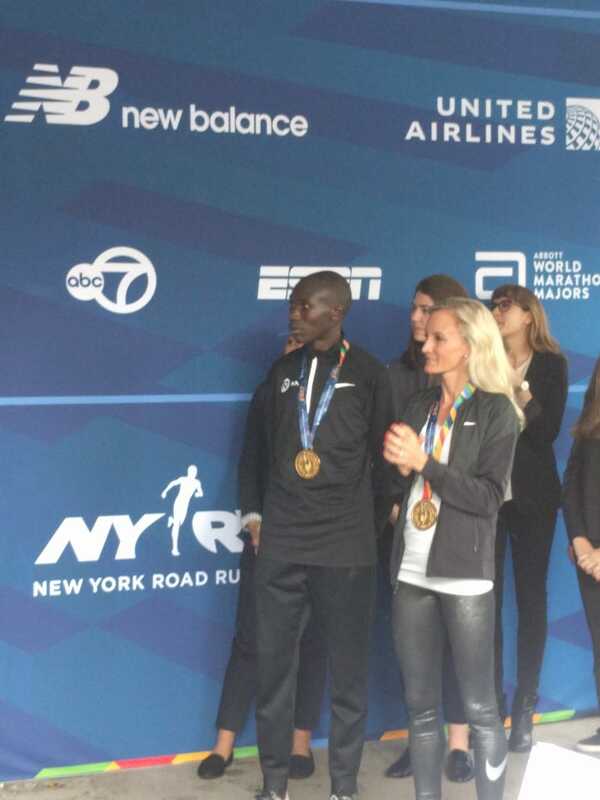 I was very much going to New York to do the marathon and nothing more. I have been to NYC before and alwys remembered it being boring and unexciting. I had previously done all of the typical touristy things and had not been impressed. I am fairly cyncial of paying for a view when near enough every view is great anyway, nor do I like paying over the odds for things because everyone else does/TripAdvisor told me to. Staying in Brooklyn was the greatest decision ever. Brooklyn is awesome. To be honest, you absolutely do not ever need to leave Brooklyn. Everything Manhattan offers, Brooklyn offers a better version. 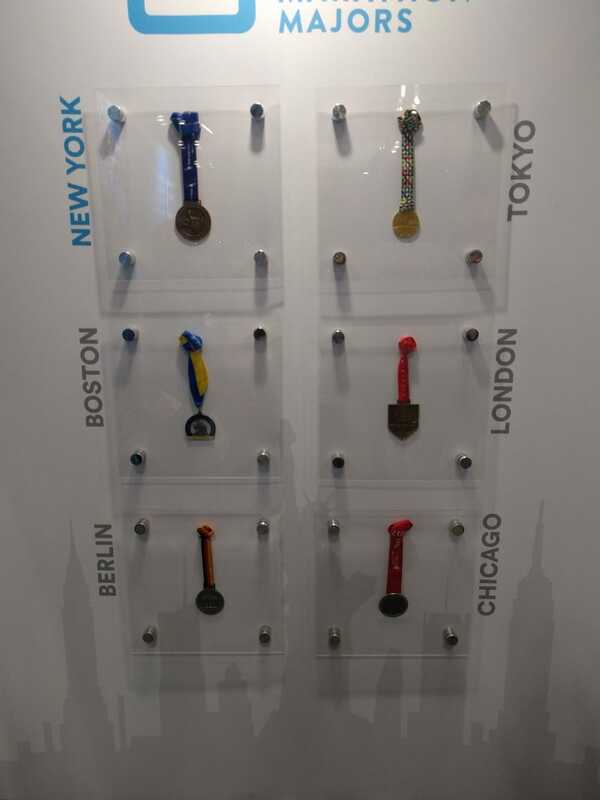 I did visit all 5 boroughs (during the race), but did not get to appreciate that all because I was somewhat uncomfortable/in pain. Loads of good food. Muscle Maker Grill is the best takeaway ever, and the burritos at Maya Taqueria are to die for. New York City is definitely awesome and liveable but it is pretty darn expensive.